It was in 2014 when we started to see the first signs of “something is looming around the corner” in HR (by the way, we were not alone). 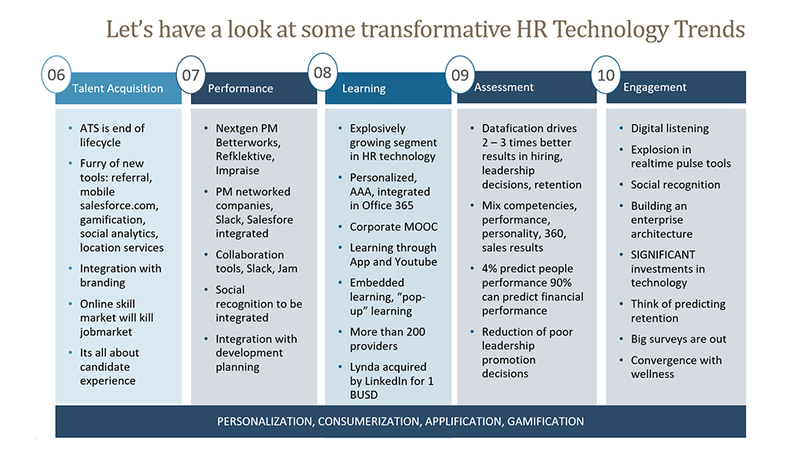 When we first published in 2016, we predicted that classic HR transformation was an end-of-lifecycle product. 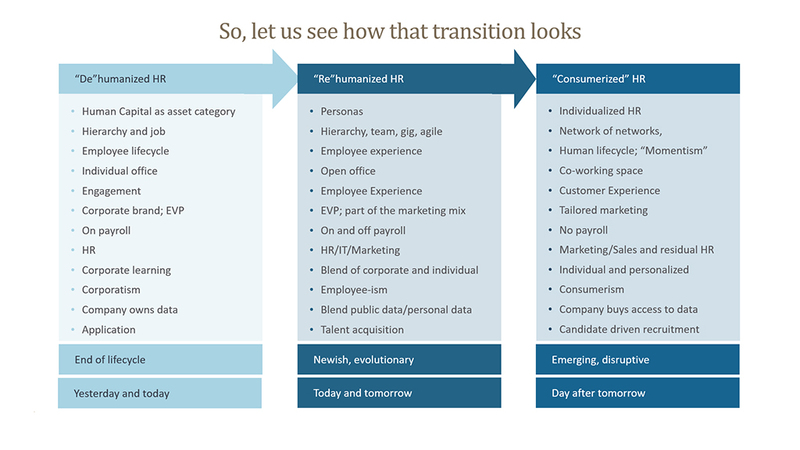 Now, more than ever, are we convinced that betting on a “classic HR transformation” is a sure loss. Having arrived almost in 2019, we believe that our predictions are correct; we are at the beginning of a disruptive change in the world of Human Resources. This article will provide the background to our thinking and will articulate how we see the world of HR in the future. It will first provide context with a short journey in the world of technology, followed by a translation of these technology trends into the world of work (beyond the notion that jobs will be impacted and new skills will be required). We then step into the world of technology for HR and introduce the concept of consumerization and personalization (“my HR”). Chapter 4 will then merge the 3 previous chapters and explains how technology allows us to bring the “human” back into “human resources”. And in the last chapter, we summarize how all these developments disrupt HR and require a reconceptualization of our profession. Our point of view is that we need to stop refining concepts for HR that were designed for the world of today and yesterday. The world of tomorrow is going to be so much different, that current concepts (that very often are not effective today) will be misaligned in the world of tomorrow. And if we keep refining them, our profession will become increasingly irrelevant. We do not need an evolution, we will need a disruptive revolution or re-imagination of our profession to stay relevant for the years to come. Every organization and our profession will inevitably be impacted, the speed and magnitude of this impact will largely be driven by “change appetite”: do you want to be “ahead of the curve”, do you want to “go with the flow” or do you rather be “late in the game” and learn from others or, possibly the least attractive option; do you want change to be done to you. Thomas Friedman, in his book “Thank you for being late” nicely summarized how several digital ventures had its breakthrough in 2007; it is just about 10+ years ago that the likes of iPhone, LinkedIn, Github, Hadoop, Twitter, Airbnb, Facebook, IBM Watson, Android and Kindle had their breakthrough and started to penetrate markets with an unprecedented speed. LinkedIn today has more than 500 million users, Facebook more than 2.5 billion (and is growing at record speed in Africa and APAC even though it’s growth has stalled in Europe and with the younger generations), Twitter has more than 2 billion users. There are more than 25 million software engineers on Github (and was recently acquired by Microsoft). Instagram and YouTube are exploding. The book “exponential organizations” by Salem Ismael and Yuri van Geest (already in 2014!) summarized how technology is shifting; dramatic increases in productivity are accompanied by dramatic drops in price. Sequencing a DNA was 10 years ago prohibitively expensive, it is now available for dollars or cents. Solar energy is going through a similar spiraling development and in some years from now, it is likely going to replace most of our fossil fuel sources. They describe exponential growth curves (1-2-4-8-16-32-64….) as opposed to linear growth (1-2-3-4-5-6-7…..) and articulate that these new technologies, like drones, robots, sensors, nanotechnology, were all with us already many years ago, but they were in an early stage of development. Only now do we start seeing the impact, AND……..we are only at the beginning of this technology revolution. Everybody speaks these days about Artificial Intelligence and Machine Learning, what we see can be very impressive already now, but we need to accept that we are only at the very, very early beginning of this journey. What these days is heralded as AI, regularly is a repackaging of algorithms. In his most recent presentation at Singularity University, Peter Diamandis emphasized this exponential growth once more and now added a new dimension with “accelerated acceleration”. These technology trends favor digital companies. They are increasingly holding a commanding handle on the markets. Never before did we see companies achieving multibillion valuations at the speed of light. It took Google 8 years to get to 1 billion market cap. Facebook took 5 years, Tesla 4 years, Uber 3 years, Snapchat less than 2 years. Epic Games, the company behind Fortnite saw it’s valuation skyrocketing to 15 BUSD in just one year time. Most recently after Softbank stepped in for a second financing round, WeWork was valued at 40 BUSD; their main competitor is Regus; Regus has 10x the office space of WeWork, but WeWork has 20x the valuation of Regus. Despite 15 years of consecutive losses, Tesla is still valued at more than 50 BUSD. The accelerating advances in tech, the accelerating appreciation of company value; it all leads to massive and disruptive changes and every industry will be impacted. Technology is eating every industry; technology adoption is quicker than ever, and the pace keeps accelerating. Dominant technologies are Artificial Intelligence, Robotics, Biotech, Nanotech, Medicine, Neuroscience, Energy, Computing. The average half-life of a business competency has dropped from 30 years in 1985 to 5 years today and in the last 15 years, 50+% of the S&P companies have disappeared. In the next 10 year, 40% of the S&P companies will disappear. Already today we can make customized babies and grow them outside the womb (luckily, we don’t do it, but the technology is there). Heinz is experimenting with personalized food. We already see robotic companions emerging in elderly homes in Japan. There is a company in California that claims they can reverse engineer wine. Farming is brought back into the city; the first vertical farms are operating. With neuro-prosthetics we can enhance the functions in our body. The FDA has already approved an algorithm. Today we can insert a camera in a pill and have it send information to a doctor on an ongoing basis. It’s all happening out there already and this is only a tiny snapshot, only the very beginning and it will only accelerate. 10 years ago, who could imagine that e-sports was ever going to become so big? With more than 2 billion (yes, billion) involved young people, this kind of computer gaming with Dota 2, League of Legends and Fortnite has completely taken off. The e-sport world has already applied to become Olympic, big sports brands are setting up e-leagues, the best players are multimillion dollar earners. 80% of this gaming happens on Twitch (and I bet that most of us have not heard about this). Twitch was acquired by Amazon in 2014 for more than 1 BUSD and right now, most e-sports players spend on average 40 minutes on Twitch in a session (and compare this with the average time they spend on Facebook or Instagram). Gerd Leonard, a futurist, describes in his book Technology vs Humanity 10 technological mega-shifts, each of them overlapping and complementing the other. Just see how Airbnb and Booking.com through disintermediation have completely transformed the hospitality and travel industry. In 2008 the number of “things” being connected to the Internet exceeded the number of people on this planet, in 2 years from now there will be 50 billion sensors connecting everything with everything. Already now, one can buy multiple wearables on Amazon that have sensor technology incorporated. And this is just a snapshot of what is happening out there. Whether we like it or not, technology is going to be with us and impacting us on a scale and magnitude that most of us never imagined possible. And yes, we will have to answer very big questions. Will we become an extension of technology or will we be able to turn technology in an extension of us? What about data privacy? What about cybercrime and security? How will democracy work? Can we sustain net-neutrality? The accelerating pace of change in technology has a huge impact on work. Most of us have grown up in a world where most of the employees are on the payroll. We now see the early signs of a disintegration of the classic workforce models with the emergence of the extended workforce (or gig workers). With the advances in technology, it is less and less necessary to go and work onsite and no longer do we need to be at certain times in an office to get work done. Also, individuals can now offer various parts of their capabilities to different companies in different geographies; you can call this “packetization” or “unbundling”. And we can now gradually start to unbundle jobs into pieces of work and human beings into skills or capabilities. What we will gradually witness over the years to come is a shift from “managing people” to “distribution work”. Let us dive deeper into this development. Go back some 10 years ago and most of us felt totally comfortable with a company as the dominant form of how we organize work. We have all grown up with the idea that work is bundled in jobs, that human beings work in jobs and that many jobs together form a company or an organization. And in order to make the company function, we have created “vertically distributed” power systems; there is a boss who ultimately calls the shots, there are people reporting into the boss, information is shared along these lines, managers “own” employees, give work orders, control it, performance is managed, trained is provided. Competency profiles complement this, including competency-based interview guides. To manage succession, systems were designed to “control” this supply of talent through high potential identification, succession planning, 9-boxes, leadership development programs. This “old way” of doing things dates back to the beginning of the industrial era and is built on the notion that a group of leaders at the top of the organization devises a strategy. That strategy is passed on to a headquarters team who creates the supporting processes, systems and programs for that strategy. In HR, these are Performance Management, Talent Acquisition, Workforce Planning, Leadership Development, Succession Planning, underpinned by an enterprise resource system e.g. Workday, SAP, etc. Then begins the cascade. These processes or system is ‘rolled out’ to the countries and business units, with instructions to ‘operate as instructed’. Success measures are based on implementation – how many enrolled, how many with goals, etc., rather than on business impact or value to the business. Processes and systems in this world tend to be feature driven: ‘We’ve thought of everything you might need.’ However, many of these processes don’t deliver what they are supposed to do and our organizations are littered with performance management approaches that don’t lift performance, with learning programs that have zero impact or relevance and numerous other activities that fail to increase value or competitive advantage, let alone excite our workforce. What we have been trying to do for so many years, is to manage human beings as “production assets”. These human beings work and in exchange they get money. We, the companies, have done and are still doing everything possible to make people and processes and systems work in the most effective and most efficient manner. We have created a world where consultants have designed all kind of interventions to make this system work better, drive productivity up, create cost efficiencies, shorten life-cycles, redesign processes etc etc. And all the time, we have attempted to motivate and engage those ones who are working in these jobs. We ask people in a company to be the best version of who we want them to be and almost all of this is coming out of the underlying assumption that work needs to be organized by someone. In this “model”; employees are an asset class that needs to be managed through systems and processes and where line managers hold a monopoly on information, praise, punishment etc. This “model” ……is the world of today and yesterday. Let’s walk through the world of tomorrow. What happens if this model to organize work is no longer sustainable? What if most of the workers for a company are no longer on a payroll. What if they don’t see a corporate career any longer as the holy grail. What if work is being sourced through platforms and online talent markets, where a worker is working bits and pieces on different kinds of work for different companies at the same time. And where we can unbundle jobs in pieces of work and unbundle human beings in capabilities? What if we move from “vertically managed people” to “horizontally distributed work”. And what if crowdsourcing will become the routine and what if “access to capabilities” is more important than “having an employee” on the payroll? And what if we can move small pockets of work all over the globe, breaking company and country boundaries. All of these developments are in the making as we speak and with the accelerated pace of development in technology, this is becoming reality sooner than most of us think. This model is emerging. On top of this, robotics and AI will complement and accelerate this development. In a recent test 25 law graduates were asked to review a non-disclosure agreement. It took them on average 2 hours with a 90% accuracy rate. A robot had a 95% accuracy rate and it took only 26 seconds…..
Any work that we do, white or blue-collar, is in principle ”robotizable”. The Robotics industry was 48 BUSD in 2017 and it is growing with a 15% CAGR, so in 2022 this industry will have doubled in size from 300.000 to 600.000 robots. And this is most likely an understatement. Foxconn is now 50% robotized and they already have robots that can help making robots. And what if OneWeb, Samsung and SpaceX are successful with nano-satellites? In 10 years from now (and they are well on track) really everybody on this planet will have access to the internet, really everybody will have a smartphone and really almost any piece of work and information can move anywhere at any point in time. Most countries will then be on 5G. These developments will drive the growth of the online freelance economy and this represents a significant shift in how labor markets operate. We believe that we are still in the early stages of the online freelance economy, with a multi-industry and multi-decade global shift affecting how businesses find talent and how people want to work. In today’s economy, knowledge is a key driver of productivity. The first and second industrial revolutions of the 18th and 19th centuries created the industrial economy and moved workers from farms to factories. The third industrial revolution of the 20th century created the knowledge economy and moved workers from factories to office buildings. The World Economic Forum believes that the global economy is now undergoing the fourth industrial revolution, fuelled by rapid technological advances. One of the defining features of the fourth industrial revolution is the transformation of how and where work gets done, as work is increasingly no longer constrained by location. In the fourth industrial revolution, instead of the worker moving to the workplace, we are seeing that work is moving to the worker—collaboration is less constrained than ever before by physical proximity and geographic borders, particularly for highly-skilled professionals. Rapid technological advancement and innovation in connectivity, communication, and collaboration solutions continue to enhance remote work capabilities and increase trust. Additionally, the global workforce is now able to access technologies and tools such as email, enterprise resource planning, and customer relationship management from anywhere with a laptop or mobile phone. With continued innovation in remote work capabilities, businesses are increasingly able to effectively connect and work with non-local talent, and the benefits of geographic proximity are diminishing. According to a McKinsey Global Institute report, an estimated 11% of service jobs worldwide could be performed remotely. Illustrating the increasing amount of remote work, the number of telecommuting workers grew 115% in a decade, from approximately 1.8 million in 2005 to approximately 3.9 million in 2015, according to the 2017 State of Telecommuting in the U.S. Employee Workforce report. In the Accenture Technology Vision 2017 report, Accenture forecasts that in the next five years, on-demand work platforms will emerge as a primary driver of economic growth in developed and emerging economies worldwide. We believe that prevailing conventional methods for sourcing talent, finding and completing work, hiring, and making and receiving payments will be increasingly inadequate. Since 2004, 95% of the new jobs/work that has been generated, happened offline. It was only 10 years ago that iPhone, LinkedIn, Github, Hadoop, Twitter, Airbnb, Facebook, IBM Watson, Twitter, Android, Kindle all had their breakthrough. We now know that technology accelerates and disrupts. Already now we can virtualize and externalize work through platforms like Upwork or Toptal or Gigwalk. Did you know that Upwork this year 1.5 BUSD in revenue and did you also know that there are some 500 (yes) online talent markets already established? And that they are starting already to disrupt the advertising industry. 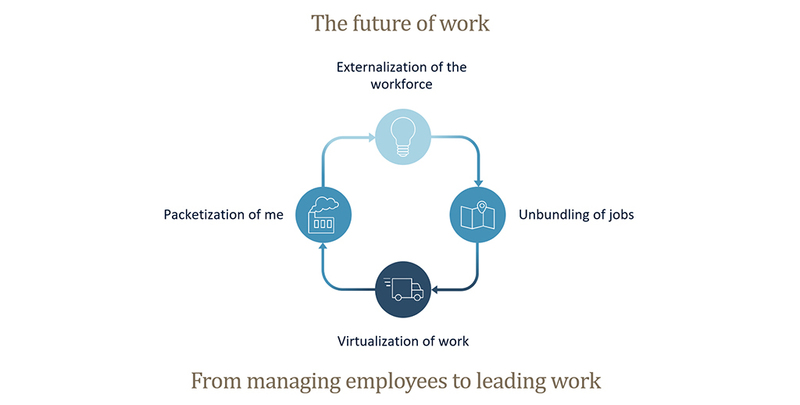 If we can virtualize and externalize work now, just imagine what we can do in 10 years from now and what does this mean for the concept of a company? It is our prediction that “the company” as a vehicle to organize work is an end-of-lifecycle product and that we will see the emergence of a flurry of platforms and networks where work and capabilities will be matched. And this model leads to a situation that everything will become a network of networks and that the company as the dominant form to organize work will be replaced. Start thinking “horizontally distributed work” versus “vertically managed people”. This essentially means that almost all the concepts in Human Resources that were designed for the world of yesterday are going to become obsolete over time because work will be distributed differently. In other words, if we don’t need jobs any longer, why do we still need companies? But…..if jobs and organizations are disappearing, what will they be replaced with? When people who work for us no longer are on our payroll, how will we get work done? What happens in this world where opportunities are democratized? In order to answer that question, we need to add one more element to our thinking and this has to do with consumerization, individualization, and personalization. It boils down to the notion that work is going to become the next element in the marketing mix. When we market work, just like we market products, we are essentially going to apply the same principles as the ones we use in marketing; we segment, we differentiate, we research, we target; in other words, just like we are building for customers a “customer journey”, we are going to do exactly the same for the people working for us; we are going to design an “employee experience”-centric context where we deeply engage with the people working for us. In the “old” concept, we want people to become the best version of what we want them to be, in this “new” concept, we will want them to be the best version of themselves. We will constantly ask them how they feel and what we can do to make them happy. This is essentially the same as we do for customers. We know already for long that people will give their best when they feel listened to and cared for. It is still early days, but now, for the first time since the industrial revolution, we no longer need to think of employees as “collective assets” that need to be managed, but as individuals who can be listened to. And with this paradigm shift, we will be able to abandon the notion of talent ownership where “we decide for you”. Many companies have started already to replace the classic performance management systems, which were completely designed on dehumanized “vertical thinking” and objectives cascading, replacing it with more frequent check-in and coaching discussions. But this is only the beginning. We predict that all the interventions that we use in HR will need to be redesigned. And this redesign will be based on an employee-centric point of view. Why does onboarding need to be designed by HR, if you can also ask your new employees? Learnvest did this and within 3 months they had everything on video and sitting in slack….AND…onboarding was managed by the crowd; it was no longer HR having ownership, but the employees managed onboarding. Try to imagine a candidate driven talent acquisition process, where candidates decide whether they want to proceed to a next round, as opposed to a recruiter. Where recruiters are becoming experience designers for potential prospects and use cutting-edge technology with gamification, video etc. Where candidates get immediate feedback from smart machines, as opposed to having to wait for ages. Still, at the end of the process, there will be human interaction, but already now, all technology is there to make this work today. Why do we need succession planning if we know that in most cases it does not work anyhow, why do we use 9-boxes, if we know that the assessments of many line managers are flawed, personalized and biased? Maybe it is better to design marketing campaigns for interesting work and positions and let interested candidates self-select with extensive use of personalized feedback, assessment and technology. Or how would it be to hire for 1 month 4 gig-workers for a talent strategy redesign project as opposed to bringing one person onboard on payroll? After all, what is more important; having a top talent on the payroll (=managing employees), or having access to top talent to get work done (=distributing work)? How would it be if you can abandon your Learning Management System and if each worker manages his or her own learning portfolio, where all kinds of learning are available inside and outside the company, on and offline, anytime, on any device? We believe that an agile workforce will open a window of opportunities in terms of flexing costs, getting access to capabilities, scaling up and down etc etc. The HR software market is now some 15 BUSD and expected to grow to some 25 BUSD beyond 2020. The story is simple and has repeated itself. Just as a cottage industry of online recruitment, learning, and performance management vendors disrupted incumbents in the early 2000s (prompting SAP to pay $3.4 billion for SuccessFactors, Oracle to pay $1.9 billion for Taleo, and IBM to pay more than $1.1 billion for Kenexa), a new set of disruptors are doing it again. However, today, still more than 40% of large multinationals are working with an old-style on-premise technology. And all of them are a prime target for the explosively growing cloud and SAAS market. They are lured into the comfort that “the other 60% is already moving into the cloud” and that they should be doing this too. If we can give any company one recommendation on technology; please do critically ask what your needs are. Do you need globally aligned processes or do you need an employee-centric technology design? Over the last 10 years, SAP and Workday (and to a lesser extent) Oracle have captured the markets for cloud-based HR systems and technology. They all work on the assumption that HR processes from company to company, from industry to industry and from country to country are substantially similar, not substantially different. All of these systems have been designed from the companies’ point of view. This allows them to “discipline” a company and provide the feeling that customization of processes is no longer needed. Indeed, a company can only configure and no longer adjust it to their liking. These systems, however, were designed with the world of yesterday in mind. They were built using this vertically distributed model, where work is translated into jobs. These systems were never designed for a world of work where everything is a platform, where most workers are no longer on payroll. The underlying architecture of these systems is a fairly stable and predictable org design with relatively clear lines of reporting. Yes, they do work hard to make their current technology landscape more up-to-date; they work with analytics, they make them more customer and employee-centric, but….none of this addresses the underlying system design. We predict that actually, these systems will make companies less agile, and this is just about at the time where they need to become more agile. These systems were designed with “managers” in control and these days we are moving towards “workers” in control. As we are moving toward an employee-centric world, we actually need a technology environment that is designed starting from the individual workers needs in mind. Companies have a “bring your own device” approach for your smartphone. In the world of employee centricity, it will be necessary to transition towards a technology environment, where “I can bring my own HR”. This is also exemplified by the gradual transition from a company owned desktop solutions towards user-centric smartphone solutions. These days, the software development market for Human Resources is exploding and more and more venture capital is injected into a market that promises interesting returns. We see cool HR tech start-ups mushrooming and blossoming everywhere and most of them do take an enterprise point of view, but they typically focus on one processor one step in the process only. Let’s take a look at Talent Acquisition as just one example. Until a few years ago, there were essentially two options to streamline the process; Taleo and Brassring were the dominant forces in the market. A look behind the user interface shows that these systems were designed to manage a process once a job needs to be posted and a candidate expresses interest by submitting a CV. By slicing and dicing the process, every step has been meticulously designed and programmed to build efficiency and predictability in the process. While this may be intended to help a company, neither Taleo or Brassring were ever designed with the candidate experience in mind. Two developments are now disrupting these “process tools”. First, there is more and more technology available to assist candidates and companies in the “CV”-submission and candidate selection process. From video-CV’s to video-interviewing, to gamification etc, all these new technologies disrupt one element of the process and through API’s, every attempt is made to integrate these new tools into a classic process. Secondly, there is a need to move away from process control towards candidate engagement. Candidates have zero interest in the system behind the walls, they have however every interest to be convinced and seduced that a company has an attractive proposition; they want to learn and see how life is at the company, they want to be contacted on social media with their social profiles. Remember Twitch, the streaming channel for e-sports? This is where the digital natives hang-out. They live in a digital world and expect an equally digital experience when they get in touch with a company. There is an increasingly diminishing patience for companies that do not provide an attractive digital experience. As mentioned before, already now, with an intelligent use of technology, the ownership of the candidate experience and the selection process can be handed over candidates. With the worker at the center, we will need to design segmented, well researched and increasingly individualized experiences for potential prospects. 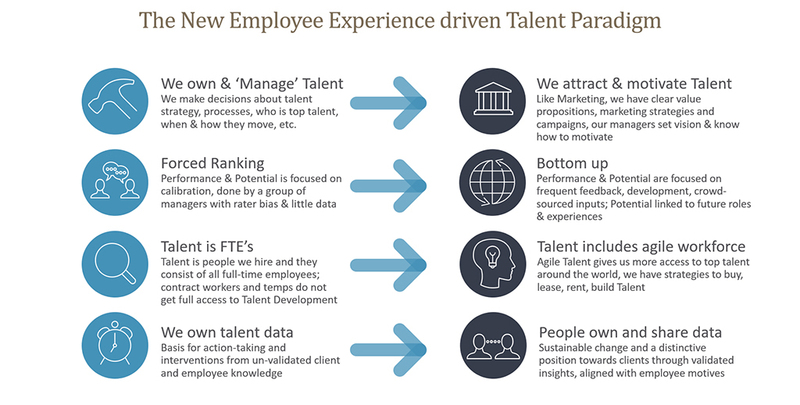 Talent Tech Labs, a New York-based incubator and research firm in Talent Acquisition and technology has reviewed more than 1.500 start-ups in this space, with each of them claiming to offer solutions that will dramatically transform the talent acquisition process. By the way, a very intriguing development is that more and more non-HR people are making disruptive decisions about the HR universe. On the software side, as well as on the investor side, we meet more and more participants who have not grown up in Human Resources. They may have seen a broken process or tool, or they may come out of a PE environment, or they may have developed something from scratch in the HR domain, without ever having asked an HR professional. This “HR-ignorance” is both a good and a challenging development. The HR function needs fresh ideas and perspectives, but we may end up with decisions impacting the HR function that was taken by people who have never “lived in HR”. Let’s look at one more example and consider the learning space. These days, most companies are working on the implementation of simple to complex learning management systems, all designed on the assumption that there is a role, with clear requirements, competencies that have been agreed, a progressive structure of seniority with accompanying (leadership) capabilities. All these systems aim to record the learning journey and ensure that companies, people leaders and individual employees have a complete overview of what has been learned, they show capability gaps and have an offering that can be matched to these gaps. The most progressive ones (like IBM) have in the meantime an intelligent, AI-driven learning environment with nano-courses, MOOC’s and anytime, anywhere solutions. However, these solutions are designed from a companies’ point of view. They may increasingly be user-friendly and have an employee-centric design model, but they are built on a job architecture that is a product of the world of yesterday. When we talk today about a Netflix of learning in a corporate context, it is still based on the architecture of work in the world of yesterday. We predict a gradual shift towards an individualized and worker-controlled learning management repository. Like a kind of Shutterstock or Github, everybody will record their learning portfolio in a publicly accessible repository and make this available to the employer they choose to work with. LinkedIn started doing this some time ago with their skills portfolio; it did not really take off, but it will be this kind of approach that will emerge. It remains to be seen who is going to occupy this space. There is an endless list of new entrants in the HR software market, some of them coming from areas that historically had nothing to do with HR, many of these vendors are addressing a small portion of the market only or they just take one topic in their hands (culture, AI, team dynamics, pulse surveys, video interviewing etc etc) and we will witness over the years to come a highly fragmented HR software market where the dominance of the large cloud-based systems will continue (as there is still a large unmet need to move away from on-premise systems), but this will be complemented by myriad of plug-in tools. A one-vendor approach is obsolete, and companies increasingly will need to ask themselves the question “what works here”, rather than “what’s out there”. The HR software markets that are emerging and developing are related to wellbeing, to the datafication of assessments, to sensor technology and video will be all over the place. Already now in China, some companies have their production workers wear helmets that can register early signs of stress and allow them to intervene early, rather than late, when the stress has already kicked in. This may seem scary as “big brother” is watching me, but we predict that healthcare providers and insurance companies will significantly invest in this market. We, workers, may be interested to live a healthier life and companies may want to create a healthier work environment. 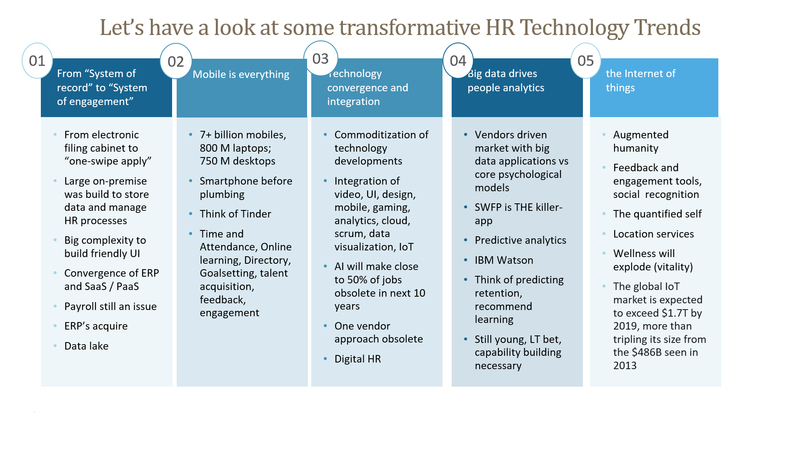 The previous chapters described the changes in technology, how this impacts work and companies and how HR technologies are disrupting Mercer in their 2018 report describes a “thrive” contract, where the deal with a worker is around growth, purpose and impact, where people are seen as value creators that need to be given the opportunity to grow and be leveraged and where the value proposition is exchanged with individual rewards in exchange for a wide range of contributions and where the main concern is stagnation. This “thrive contract” fits well in the world of tomorrow. In our dictionary, this is “consumerized HR”. The world of today can be described as an engagement contract that should meet psychological needs, equity and camaraderie, where employees are assets that need to be acquired and optimized and are rewarded with a broad set of equitable rewards in exchange for organizational engagement and where the main concern is motivation. We describe this as “re-humanized HR”. These two worlds contrast with the world of yesterday where employees have a loyalty contract and their needs are covered by pay, benefits and security, where employees need to be retained as an asset and pay is connected to time and output and where the main concern is turnover. This is what we call the “de-humanized workplace”. “Thriving employees” are 3x more likely to work for a company with a clear and compelling purpose, they feel 10X more career empowered, they are 3x more likely to say that their company focuses on health and wellbeing and are 5x more likely to say that their pay is fair and equitable. These numbers contrast significantly how most of the companies today are structured and organized. Most HR departments still live in the “loyalty” world, that finds its source in the industrial age. Simultaneously, knowledge workers are increasingly demanding flexible and independent work arrangements. According to economists Lawrence Katz of Harvard University and Alan Krueger of Princeton University, 94% of net job growth in the past decade was in the alternative work category, which they define as temporary help agency workers, on-call workers, contract company workers, and independent contractors or freelancers, and over 60% was due to the rise of independent contractors, freelancers, and contract company workers. The freelance workforce is one of the fastest-growing segments of the U.S. labor market. From millennials to retiring baby boomers, the number of people choosing to freelance is growing. Talent markets will become increasingly fluid, where the workers on a given project can be on-payroll, off payroll, where work can be crowdsourced and developed in partnership with the competition. This requires a completely different approach to HR; it requires a thorough understanding of the internal and external market in terms of capability and availability. It also requires a thorough understanding of talent and capability needs against business demands. And on top of this, demand and supply need to be able to find each other through a “matching process” in a diverse talent ecosystem. And the blend of these workforces needs to be managed. Jon Younger was one of the first developing a framework for this in his book Agile Talent back in 2015. Research carried out by Oxford University and recent research by Upwork, both on the corporate side and from an individual worker’s perspective underpin the rapid development and penetration of online talent markets that will complement the “on-payroll” talent markets. Previously, we discussed that work can be externalized and virtualized. Next to this, we can also unbundle; this essentially means we can unbundle a job in “pieces of work” and we can unbundle human beings into “capabilities” (others may call this skills). And the future of the marketplace for work will be one, where work and capabilities will be matched, and no longer will we look to bring humans into jobs. This fundamental transition will force us (again) to completely rethink how work can be done. But….this also allows us to become much more targeted in the work that we assign. If a job is now a combination of “pieces of work”, we may have quite some elements that are either unattractive or less suitable for me. In other words, to get to my favorite piece of work, I need to accept working 50% of my time on stuff that I don’t like, doing it with people with whom I don’t feel aligned, in a location that does not serve my needs and on times that do not fit with my family life. And we accepted all of this in a time when other options were not possible, but now that technology changes these paradigms, we can get back the control over our work, at the location where it suits us, on the times that are a good fit with our family life and with people we select myself as coworkers. This is going to be the future of work. It will take some time before we really get there, but technology will allow us to go that route. This is what we mean when we argue that technology allows us to bring the human back into work and human resources. Part 5; Now that we know this, what does this mean for the world of Human Resources? Most of us in HR have grown up in the world where we have designed corporate HR programs; we all know the employee lifecycle and for every stage of this cycle, we have solutions on the shelf. They have all been designed with the underlying assumption that an employee is a corporate asset and that we need to “manage this human asset” through interventions that make them more aligned, productive, engaged, high performing, flexible etc. It is not without reason that the terminology “Human Capital” emerged and it also all sounds so logic in the organizational models where work is bundled in jobs and jobs are bundled into an organization or company. If you dare to believe that this model is about to be disrupted, you will need to accept as well that what we call Human Resources, will need to be disrupted and re-invented. We essentially need 3 big changes. The first one is focused on WHAT we do in Human Resources, the second one is HOW we go about doing our work and the third one is how we ORGANISE ourselves to get our work done. Human Resources in the context of the Future of Work is centered around the marketing and sales of work, the build-up of an agile workforce in a combination of on- and off-payroll workers, and the design of worker experience centered interventions (today we call this employee experience) that facilitates this to get work done. First of all, most of us have some level of experience with strategic workforce planning; only in the recent years have we seen progress to better predict the demand and supply of labor against the context of a business outlook. Quite some of these SWFP initiatives were and are still quite HR centric, possibly miss the connection with business planning and were somewhat limited in its impact. In the new world of work, we will need to develop a methodology for skill or capability planning. We do need to find a way that allows us to predict the kind of capabilities we need in order to get our business plans successfully implemented. And we cannot develop this “within HR”; this kind of planning needs to happen in close harmony with R&D, production and supply, Finance and sales and marketing leaders. HR will also need to develop a keen understanding which works can and will be robotized, so capability predictions are aligned with technological advances. Once we know the kind of capabilities we need and technology adoption rates, it will be upon HR to do research and identify where these skills can be sourced. HR will need to inform business leaders and help them understand whether business plans can successfully be executed, considering the availability and access to the capabilities required. And it may very well be that HR leaders consult business leaders to move work outside the boundaries of the organization and into alternative geographies and online marketplaces. HR may also consult them to build a blended workforce with capabilities accessed from multiple sources. Once the plans are set, it will be upon HR to “market and sell” this work on the labor market. Based on their market research, HR will need (just like marketers do this) to segment the market, identify the right channels to get connected with the prospective workers and design marketing and sales strategies that convince these workers to make their capabilities available (rather than convincing them to join a company). And HR will need to understand through which platforms these capabilities can be accessed. HR will need to understand at a micro-level what the drivers are of their prospective workers, so they can design strategies to win (part of) their capabilities for their brand. The big differentiator compared to today is that HR needs to search for capabilities as opposed to human beings. Sometimes these capabilities come with a “whole” human being and also to the company premises, but often, this may only be a “part” of a human being and the differentiator is no longer to win the whole human being, but it will shift to get access to the capabilities of that human being at the time and the location where the worker is, not where the company wants the worker to be. These labor markets will increasingly be “datafied”, HR will need to design and deploy methods and approaches that allow them to “read” these markets through a data-lens and apply sophisticated approaches to identify and access these capabilities. These capabilities are still “sitting” inside a human being, so it will be essential to develop sales and marketing approaches that appeal to an individual worker, so he or she is interested to make his or her capabilities available. Today we call this “employer branding” or “employee value proposition”. These are company driven, rather generic initiatives to position a brand, but they do not start where the individual worker is. The Future of HR marketing is to get under the skin and understand the psychological DNA of an individual worker. We predict that workers will increasingly be willing to give companies access to their data, with the expectation that this data availability will improve the matching between worker, work and teams. HR will also need to lead the dialogue around the externalization and virtualization of work. How much work will need to be done on-premise, what can be done online and offshore? A core element of this capability planning is to finetune the level of agility. How much flex is required, how much stability is needed, which kind of capabilities are core or scare and may require a different approach compared to abundant capabilities? The third element around the WHAT is the design and development of an employee (or better) worker-centric culture. With the shifts described before, it will be largely upon HR to design the building blocks of a working environment that is completely designed around. HR can develop to become the spider in a web and design interventions that make the worker feel engaged through culture enhancing initiatives that touch all on and off-payroll workers. HR can co-design an environment where information flows freely from individuals to teams and where organization network analysis underpins how work is being executed. Companies have increasingly used more sophisticated technology based feedback tools to understand customer drivers. Marketing uses sensors, point-of-sale surveys, online pop-ups and a variety of other means of ascertaining what makes people buy, what makes them come back, what makes them buy products or services with higher margins, etc. To create competitive advantage, companies have sought to understand and improve the total Customer Experience (CX), with the rationale that people will attach greater value and loyalty to an ‘experience’ over an isolated product. Overall, research by Forrester, McKinsey and others point to 2x financial performance of Experience-driven companies vs. non-CX-driven companies, more than double the brand loyalty and significantly higher profits. Given the enormous financial value, CX has become the focus of many companies across industries. If we want to provide a better overall experience for external customers, shouldn’t we focus on how we improve the Employee Experience? Especially with all the aforementioned changes, shouldn’t we be doing all we can to ensure we understand the drivers of our workforce – what attracts people to us, what makes them outperform their peers, what are the situations where teams innovate and collaborate best, and what makes some people great leaders? Companies have been trying to crack this nut for decades with little to no breakout growth and performance. We suggest the reason for this is, that we have been looking in the wrong place for the tools and methods for exceptional performance and engagement. If you ask any HR or business leader today how they approach attraction and development of Talent, they will talk about a process that was most likely copied from another organization. Benchmarking and modeling over decades have left us all looking quite alike. Great for large consultancies but deadly for competitive advantage. Furthermore, most strategies and their resultant processes are usually devised by people at the top of the organization – those furthest removed from customers and with the least understanding of the current problems to be solved. What then is the solution? Employee Experience, like Customer Experience, seeks not to understand what works everywhere, but to see ‘What works here.’ To build a competitive advantage, we need to understand how things work best for people in a particular organizational and cultural context. To do that, we’re going to have to think in a completely different direction than what we’re used to: bottom-up versus top-down and outside-in vs inside-out. We need to leave the notion that we want you to be the best version of what we want you to be. Both Employee Experience (EX) and CX work the opposite way to what was described above. In CX you start with understanding the customer and work your way up to the Strategy. CX and EX are the same in theory, method and implementation. The focus is on the End User or the User Experience (UX) and what drives value, which could be 2-3 main features vs. ‘everything you might need’. To follow this new approach, you start with the End-User – the person closest to the customer and help define the problem(s) to be solved. Then you work your way up the organization, creating, testing and piloting new prototypes for working often in as little as 2-4 weeks, pitching it to the business based on ease of implementation and business value, and only then do you go live across the organization. So, in contrast to the current way of working, EX and CX deliver a minimum viable product (MVP – meaning 80% complete), which is tested and proven, accepted on business impact vs. a process borrowed from a benchmark, focused on what the End User needs most. The foundation of this is Design Thinking and specifically human-centered design. Don Norman, one of the foremost thinkers on Design has written that ‘Experience designers emphasize emotional impact’, while industrial designers emphasize form and material and interactive designers emphasize understandability and usability. A second emerging discipline in EX/CX that supports Design Thinking is Journey Mapping. It’s important to first understand the current, as-is journey people experience, and then there is a growing psychology around Journey Mapping. Again, it is not to force-fit the journey to the current paradigm, like the Employee Life Cycle, but rather what is the holistic experience people have. Enel, an Italian-Spanish Energy Consortium has journeys for remote working, digital tools, and many other non HR touch points. Companies who are successful in EX and CX build cross-functional coalitions to serve and support the User Experience. In EX Pioneers Airbnb, GE, Cisco, Adobe, BMC Software and others, HR teams up with Marketing, IT, Facilities and everyone who touches EX. CX and EX become linked when the EX focus is on the parts of EX that drive optimal CX. Analytics is another way to discover and leverage ‘What works here’. IBM has developed 30+ personas using Cognitive (patterns) and Predictive (algorithms) Analytics that can indicate which people are at risk of leaving and what kinds of recognition and development would best engage them, sent as ‘Push’ notices to their managers worldwide. They estimate over $700 million savings in retained talent in 2017 alone. 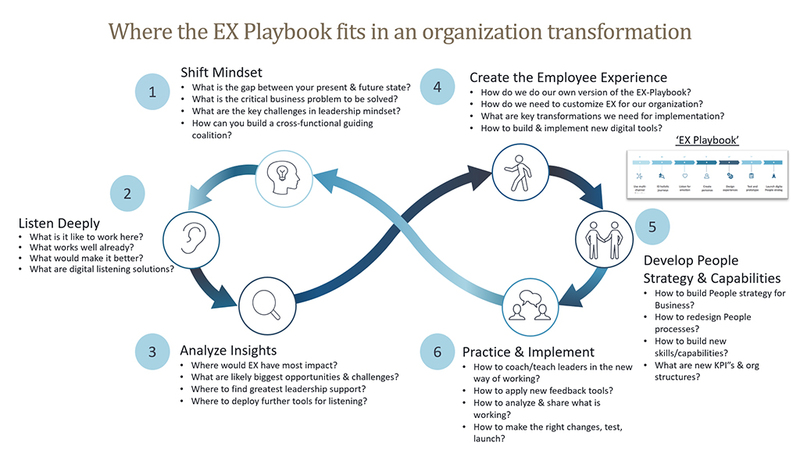 EX and CX are the foundation for your HR transformation. 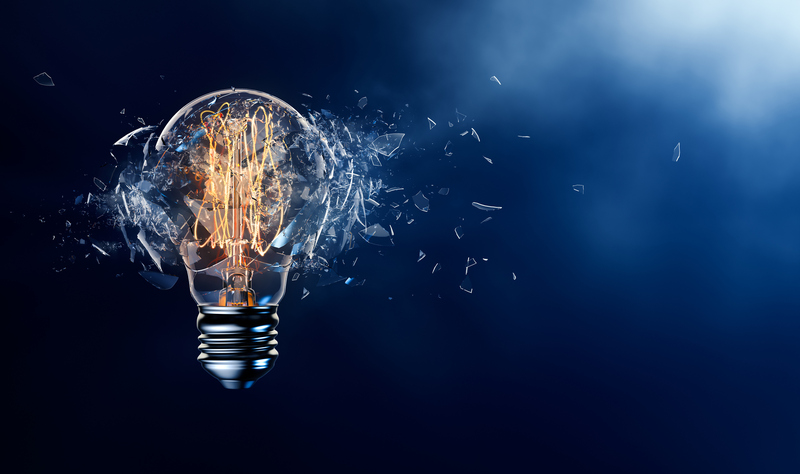 The HR Transformation of the future is centered on creating cross-functional teams that rapidly prototype DT-originated ideas that form the backbone of strategy and in turn determine new roles and capabilities. HR transformations will not be led by HR, but by a coalition of functions that impact both CX and EX. ABN Amro and Enel have Agile/Sprint teams that are led mostly by Digital experts, in coordination with Analytics, Marketing and HR. HR roles as they exist today are being replaced by people who are certified in Design Thinking, Journey Mapping, Agile Coaches, Scrum and Sprint team leaders. Traditional Learning roles, where they may exist to buy outside learning modules are instead turning to YouTube Production Managers who help internal SME’s design short YouTube video’s that are measured for success by view count and how long they are viewed. The goal of all of this is to create organizations that are more human-centered, “to bring the human back in HR” and where we understand and work on principles of where and how people do their best work, what works here vs. what works everywhere. TI-people introduces one more element into EX and CX. In their definition, EX is about all the experiences a worker can have in their interaction with the company, whether they are designed by HR or not by HR. Their next element is CxHR where they include all the experiences that HR owns and designs. EX also allows us to move away from engagement. Engagement as a measurement was invented at a time when leaders wanted to understand whether “their” workforce understood the strategy, believed in their (top-down designed) strategy and how motivated they are to deliver against this strategy. The Gallup business and other employee survey tools are all built on this top-down logic of employees as a corporate asset. Engagement metrics, however, tell us about the result of good or poor experience long after they took place; not which specific touchpoints and journeys caused the poor experience and need redesign. Engagement measurements and interventions typically are designed on an inside-out and top-down approach as opposed to bottom-up and outside-in thinking. As organizations seek to become more flexible and adapt to a world of unpredictability, they struggle with consequences of their own modus operandi – hierarchy, bureaucracy, functional silos are just a few examples of how companies were systematically organized. Agile emerges as a trend for companies thinking about how they can structure teams and work to adapt to this new world of work. Opposite to common (mis)understanding around agile, it is not a method to be followed, but rather a mindset that ultimately leads to a new working culture. Agile implications to people, processes and culture go beyond the re-design of organizational structures, systems and procedures. To take full advantage of agile benefits, HR organisations need a shift of thinking about how work should be organized and led. These 3 characteristics have a profound impact on management and HR and open the opportunity to address HR’s evolving role, particularly in areas where it can focus on value creation for the organization and on sustaining a great work experience. 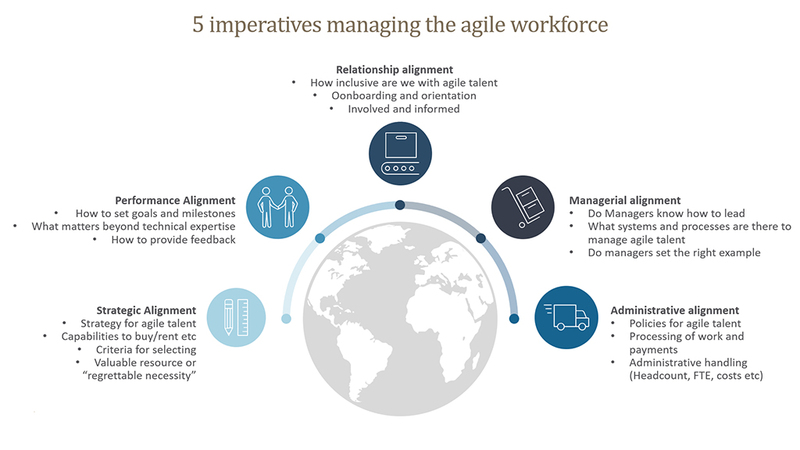 Companies who are already undertaking an agile transformation count on their HR teams to modernize their people practices building new workforce behaviors that enable the flow of agile values and ultimately impact business performance. An organization’s most important goal is to satisfy the customer. In the HR world, this translates into co-creating people practices with employees. Using an employee-experience approach, HR teams aim to build seamless solutions driven by the users, their needs and feedback. A good example is how IBM transformed its performance management system. The company engaged their entire 370,000 workforce in 170 countries through online and face-to-face “innovation jams”. For 90 days, two-way communication channels (polls, videos, prototypes etc) were opened for honest discussions and crowdsourcing of ideas. Artificial intelligence also played an important role in running text analytics. The result was the Checkpoint system in which employees set shorter-term goals, and managers give at least quarterly feedback on their progress. Goals are set for 5 dimensions: business results, impact on client success, innovation, collaboration, and skills. When talking about the shift, IBM’s CEO Diane Gherson mentioned that IBM employees are “iterating and experimenting”, which means often they’re not necessarily working towards what they originally listed as an annual objective, making any longer planning obsolete. Johnson & Johnson also took an agile approach to their performance management process. They invited employees to test an app meant to increase frequent feedback dialogs and replace their old manager-employee conversations framework. In the beginning, most pilot testers didn’t actively use the app. The company then iteratively introduced modules about successful feedback exchange on their training sessions. They also nominated some employees as “change champions” and after 3 months started to see a growing number of feedback exchange through the application. The examples of IBM and Johnson & Johnson demonstrate how HR is applying agile principles internally to generate solutions that enable organizational agility. Iterations and feedback exchange become strategical levers for how to tackle the behavioral challenges ahead. Many other companies such as Deloitte, Pfizer, General Electric, Microsoft, Accenture, and Adobe have also changed their performance management systems to help increase organizational agility. Most common practices are: replacing annual reviews and rankings with short-term goals; separating performance from development conversations, putting more emphasis on team performance x individual performance, endorsing techniques such as coaching and frequent feedback with the intention of promoting innovation and timely course-correction. Work should be broken down into smaller tasks and performed in short cycles by a cross-disciplinary group of empowered people. As mentioned before, agile teams tend to be small, autonomous and cross-functional. They organize work in short cycles and relatively small tasks, gather feedback, iterate, and re-start the cycle. In brief, the team’s outcomes are more important than the individual contribution, ensuring teams are empowered to act and can fully collaborate becomes a business priority. Other trends include the elimination of annual salary raises to more frequent adjustments that follow market trends, “real-time” responsibility required from an employee in a project, and/or current performance trends. We are also seeing companies completely shifting their individual financial bonuses to base pay or forms of non-financial rewards such as gifts, wellness benefits and points redemption programs. The secret to the latter lies on a more employee-driven approach to rewards based on a clear understanding of what nurtures employee’s intrinsic motivations. The same approach of “less and more often” is being applied to Recruitment. At GE, recruitment teams are holding candidate reviews with hiring managers on a weekly-basis to course-correct profile and job advertising strategies. The recruiters prioritize job openings according to how critical it is for the business to have that person on board. Cultural fit becomes a decision factor and candidates can expect customer-like experiences, all of that powered by novel technology. As mentioned earlier in this article, organizations are moving towards a network community composed by employees, gig workers, customers, suppliers etc. Agile organizations are a web of fluid and transparent relationships that can drive growth, innovation and overall organizational performance. The rapid assembling and disassembling of people who carry expertise, influence and decision-making power allow for communications to flow, strategies to quickly change and for ideas to spread. This concept substantially changes the roles of leaders, the responsibility for decision-making and the need to analyze the network for complex team dynamics. Agile Leaders are “servant. They motivate people at an emotional level rather than control, nurture the system instead of managing the work. They create a common sense of purpose, share a vision of what needs to be accomplished, empower individuals, protect teams from distractions and help to remove roadblocks. They unleash networks, champion diversity and encourage innovation. To empower the teams and allow for autonomy, such leaders delegate decision-making powers to frontline employees trusting they will always act in ways to satisfy the customer. In most agile HR transformations leaders struggle to let go of control, just as much as employees struggle to take it. Agile rituals such as stand-up meetings (15 minutes meetings agile teams hold every single day) and retrospectives (meeting to discuss what and how work was done, what worked and what didn’t) help to put everybody on the same page and create a culture of trust and openness. Finally, as teams form and dissolute, the complexity of organization dynamics increase. Network analysis helps to visualize the gaps between existing networks and those required to support an organization’s strategy. Such analysis can help managers map if individuals in a team are sufficiently connected, if skills and expertise of employees are being strategically leveraged, and even what is slowing a team down. Cisco has a team that identifies patterns from the best performing teams and uses it to help other teams perform better. VeriSign also uses network analysis, but with the purpose of building stronger connections among its technical employees. 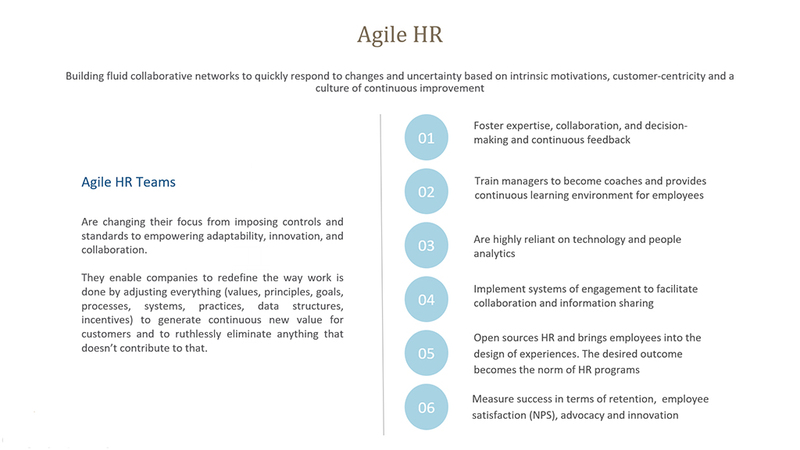 In sum, agile HR organizations as networks are amplifiers of learning, which means that on top of providing enhanced individual learning experiences, efforts should be focused on creating an experimentation culture. A failure-friendly environment that encourages freedom, creativity and reflection. Spotify has a “Wall of failure” to display the learnings from failures. The principles behind are to reinforce efforts, not just results, and identify failures as opportunities for growth. “Guilds”, hackathons and other crowdsourcing idea events are great ways to make sharing easy and broaden organizational experience and expertise. Comsysto, implemented business guilds – networks around working disciplines that enable people to learn a profession in a master-apprentice working relationship. They reported an increase in collaboration, team spirit and innovation only a few months after kick-off. In other companies like Atlassian, Cisco, DSB Bank and Facebook, HR organizes hackathons in which employees from many different areas self-organize and help create usable solutions. Besides the business benefits, they can also be considered “synchronized education days” that help break out the silos and allow for ideas to meet with influencers, skilled people and sponsors. Finally, to take full advantage of all the learning opportunities from a network organization, progressive HR organizations are powering their learning platforms with next-generation technology which identifies skills required for certain careers, map individual’s current skills levels and suggest content based on the employee’s interests, preferences and others employees following a similar path. Learning activities can be digested in minutes or hours, individuals build their own learning paths which they access on-demand. Learning badges are being widely adopted and help connect individuals with opportunities closely linked to their aspirations. Altogether, HR is already helping companies gain organizational agility by articulating strategies that allow for flexibility, speed and collaboration. As shown above (and in the spirit of agile), such goals cannot be achieved through an “HR recipe” or by benchmarking similar companies. HR itself needs to open source, experiment and invite feedback from employees to build a truly employee-centric organization. As has been noted, an Agile transformation journey will never end, there will be failures and successes, hopefully, you will be able to learn and appreciate both, at least until the next iteration.